Fortunately, most modern fabrics used for outdoor cushions are now mildew and moisture resistant. Any water will simply flow off the cushions. This, however, does not apply to heavy rain. When exposed to continuous rain, there is a chance that moisture will eventually enter the inner layers of fabric and cause rot. Due to this, during periods of heavy rain, cover the furniture or bring the cushions indoors. Even sun exposure can be an issue. Modern cushions are fade resistant, but continuous heavy exposure to the sun can cause heat damage. The fabric or material will then lose its durability. Just like the exposure to rain, it is best to cover or store elsewhere during these times. Lastly, keep the cushions as clean as possible. Follow a program of daily, weekly and monthly cleaning to keep the furniture and cushions in as good a condition as possible. Even if the current set of cushions has already been badly affected, this proper level of care can be applied to the next set of Lloyd and Flanders replacement cushions. 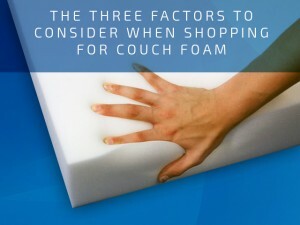 Buying the right replacement foam for your couch comes down to three factors: support, durability and comfort. Find out why each of these is so important when shopping for replacement foam. Finding the right couch foam can make a huge difference in restoring your old furniture to its past level of comfort. Nothing is more uncomfortable than sitting on old couch cushions that no longer have any bounce or provide you with any support. Not only do they not feel good, but sitting on them can make you sore. Support: You need the foam to be able to support the amount of weight of a person sitting on it without the foam compressing. Durability: A foam that you are using for a sofa seat replacement is going to be used for years to come. You need to make sure that the foam is durable enough to maintain its level of support for a long time. Comfort: Along with being strong enough to support weight and to last for a long time, you also want the foam to be comfortable. After all, sitting on a foam cushion that is too stiff is almost as uncomfortable as sitting on one that has been depressed from years of use. The key is to find a foam that will be soft enough to provide a high level of comfort will also meeting the standards of support and durability you need in a seat cushion. Countless customers turn to the Foam Factory, Inc. for replacement furniture foam. They produce high quality foam products at their Michigan factory for use in a wide range of personal and commercial applications. The kitchens, master bedroom and bathrooms are the prime selling points of your home outside of the curb appeal your front yard can set. Bigger kitchens are the most desirable, but not every house was built with a large kitchen in mind. 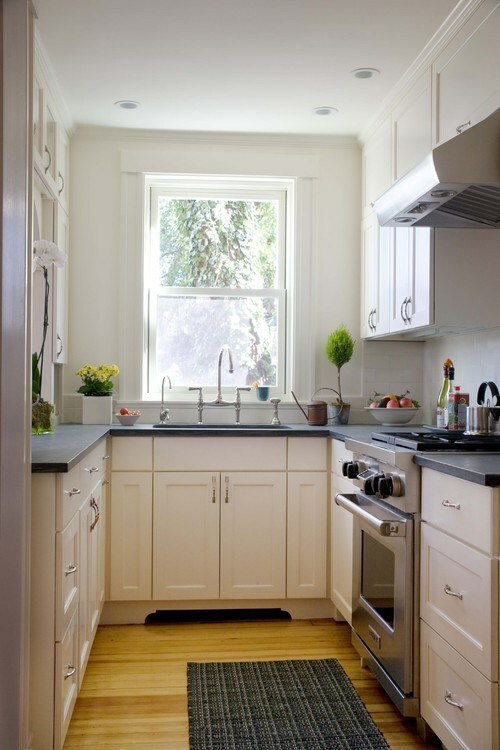 Here are some tips to help make your smaller kitchen look significantly larger. If you don’t have a load bearing wall in the kitchen, take a sledge hammer to it and you’ll create more space in the area. If you do, you can try to remove a section of a wall leading into the kitchen to make a breakfast bar area. All you need to do is extend the other side with some counter space. Open shelving and storage, as well as storage with doors all help to make your kitchen look roomy by removing clutter. It’s easy to go overboard and add too many cabinets in one’s desire to have a more open space. The solution is to utilize glass-faced cabinet doors. It’s not quite as effective at removing cabinets entirely, but it gives the illusion of space. Lots of people want to add islands when they should add a cutting board attached to a cart. This gives you more mobility, extra counter space, and keeps the kitchen from looking cluttered. Scale is very important in a small kitchen, where an oversized microwave or coffee machine can look dramatically out of place. Bio: As CEO of Realty ONE Group, Kuba Jewgieniew has unique perspective on what makes a home ready to sell. Body wedges offer a range of benefits many aren’t even aware of until they have the opportunity to use one. Most of us think we’re doing just fine until adding a body or seat wedge to our routines. At that point, we realize how much comfort we’ve been missing out on. Foam body wedges are manufactured in all shapes and sizes and are practical for virtually any use. One of their most popular is its application as booster pillows in lieu of stuffing lumpy blankets or flat pillows under your body for an incline in bed. Body wedges are also helpful for the lower body when placed under the legs or knees to provide a lower-body boost for your furniture and bed. Placed under the back, wedges can prop you up for a comfortable viewing angle for watching TV, reading, or just improving circulation and making beds more comfortable. They’re even able to adjust the angle you can perform exercises at during a workout. Smaller pitched wedges can be implemented as seating cushions for comfort, pressure relief, and help with spinal alignment. Adding a wedge seat to your office chair or car seat can assist you in sitting with a straighter posture, helping to cut down on tension and discomfort in your back, neck and shoulders. Being made from foam, body wedges can be purchased in any number of material types, from the softest comfort foam to the firmest support variety. Coverings for wedges are also very customizable, whether you want a plush fabric or a durable vinyl for easily cleaned exercise products. No matter your intended use, a body wedge can give you comfort in practically every area of your life.